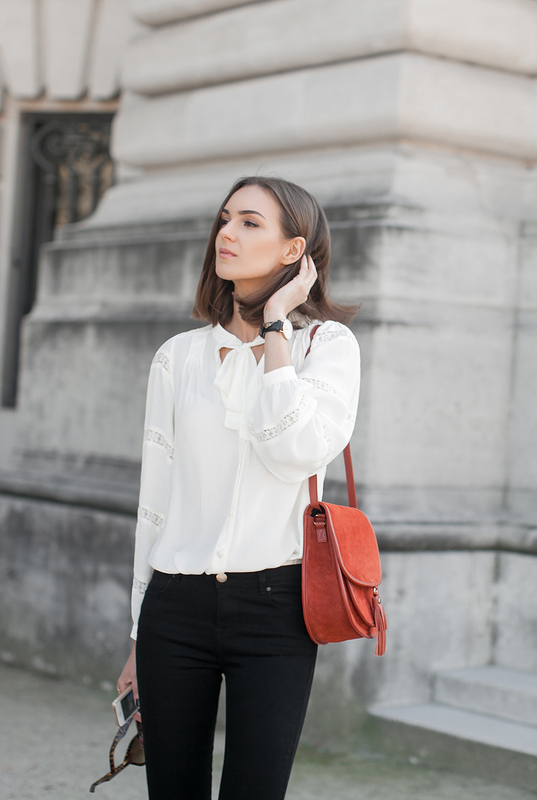 Here’s the third look from Paris I styled for Asos (the previous two here and here) and this time I chose a classic combo of a flared jean and a bohemian blouse with puffy sleeves and a bow. 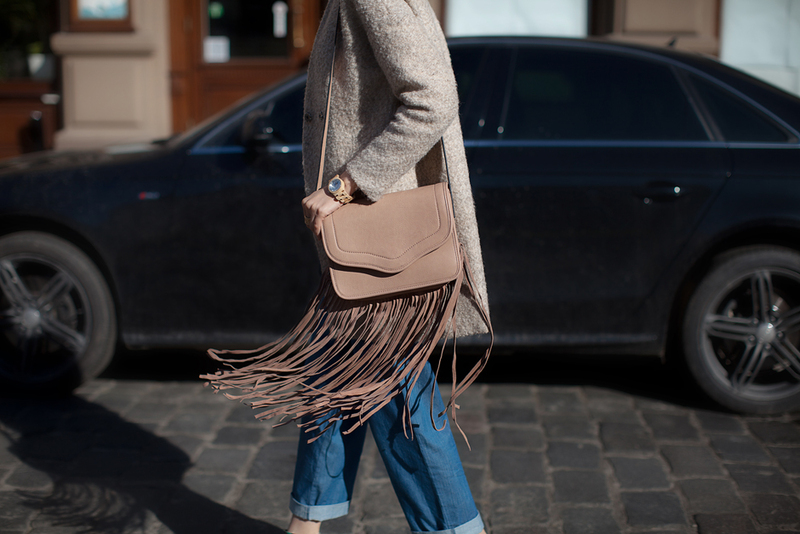 The suede saddle bag seemed like a perfect pop of color this outfit could use. I think these are the last sort of summery pics I have from this year, next stop: fall outerwear, which I love even more than summer outfits. Too bad it’s such a necessity where I am, I wouldn’t mind if it were optional. Hi guys! 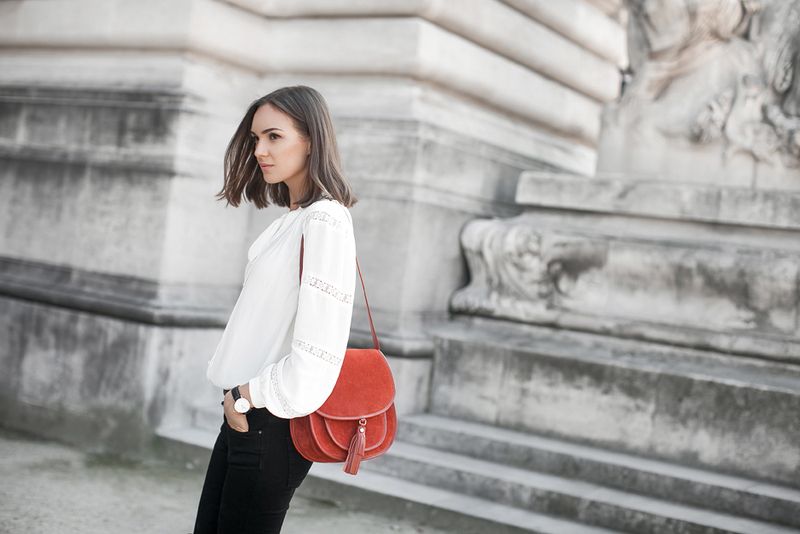 Turns out I can bring myself to post an outfit from Paris while being in Paris! This lovely coat dress was custom made by a young Ukrainian brand called Awake specially for my trip to Paris. I love all the cut outs and the oversized silhouette and I love how it looks with chunky heels, even though initially I planned to wear it with other more fashion week appropriate shoes. I can’t wait to wear it also as a coat once I get back home, maybe throw it on top of a turtleneck and some over the knee boots! On another note, today is our last full day in Paris, we’ll be catching a plane tomorrow afternoon. It’s been an amazing experience, especially compared to the previous fashion week I went to in 2014. More on that later, right now I’m running out to get some souvenirs for friends and family, will have to be super creative since I exceeded my baggage limit on my way here! Platform heel sandals have to be the key shoe of spring summer 2015 (well, accept gladiators maybe), not to mention that they are much more comfortable than your usual stiletto pumps. Another great thing about these shoes is that they look great with socks, so if you hesitated to try this combo, now might be a good time! I already got myself a pair of emerald green platforms, before I saw these ones from Asos, but they are so cute I might cave. Hi everyone! Hope you’ve had a great weekend! Right now I’m finishing all of my work before a one-week vacation I’ve decided to take, hence the lack of posts. In just a couple of days it will all be over and I’ll resume my posting, until then I’m leaving you with an outfit I wore yesterday.